3DS XL owners in the UK can now unite for one mighty sigh of relief, as online retailers play.com and amazon.co.uk are both currently advertising the 3DS XL console's charging cradle and AC adaptor as available to purchase from the 24th August, at the sum of £19.99. 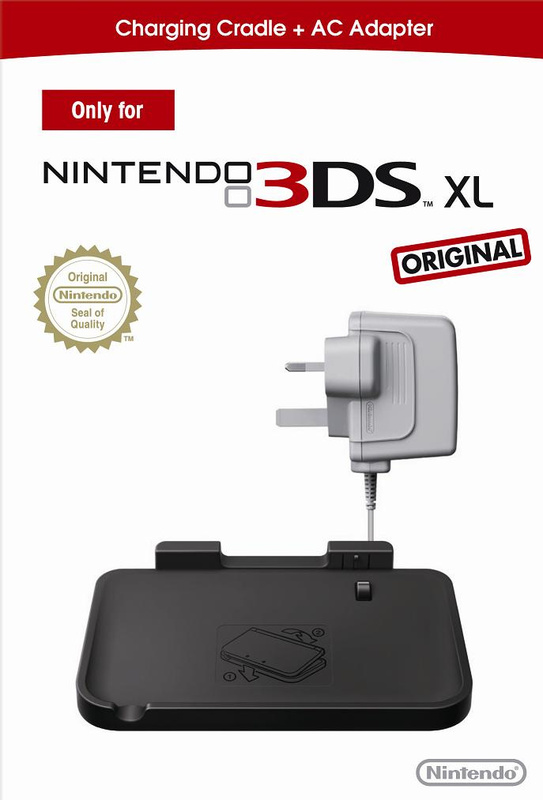 While separate 3DS AC adaptors have been readily available for 3DS XL consumers to purchase, those who like their handheld to sit in a comfortable plastic bed while they charge might want to make a note of these offers; we're sure that more retailers will be jumping on board as well. Bundle it in with the 3DS XL already! This should be free to ambassadors! I still don't understand why there is even a cradle. I mean, just plug it in! ohwel yh the craddle is stupid what if you have circle pad pro xl? @Portista I don't have a 3DS yet (less than a week to go for the XL in NA), but I think it'd be nice to not have to worry about the cable and just be able to set it down to charge. Hmmmmm... interesting. I currently got a 3DS and I don't plan on buying a 3DS XL. I still think the 3Ds XL is a slap in the face to current 3DS owners who look at the XL in envy. The cradle is a okay idea but I don't think many people will buy it when it should come in the package to begin with. I dunno, I really enjoy just setting my 3DS down in its cradle instead of potentially scratching it up by plugging it in every night. I feel it goes a long way to protect the outside of the system, and I'd be hard-pressed to get one for my 3DS XL, too. It cost £6.99 according to GAME. I would like to have a cradle for my 3DS XL, it's nicer than just letting it sit anywhere. But I'd only consider getting the actual cradle on its own, I'm already covered for AC adapters. That, and it's way too expensive, £19.99? How much of that is the Cradle? What about the CPP XL? This is a rip off - bearing in mind you can pick up a charger for less than £5, how is a bit of plastic worth the other £15? What, you can't use the DSi/DSiXL/3DS adapters? Can't wait to see Nyko release a power grip for it to extend battery life to ten hours or more... (my current 3DS runs a very, very long time with the Nyko Power grip and I keep brightness on it's lowest setting unless I'm playing outdoors in the sun, when I bump it up to 3 or 4. Where can I get a power grip? Will I need to worry about losing data from taking the battery out? I'll keep with my charger that I got with my XL. The 'charging cradle' is the biggest waste of plastic anyway. I've barely used the one I got with my regular 3DS. Don't see the point of it when the charger plugs straight into the back of the 3DS anyway, plus you can't play and charge at the same time whilst it's sitting on the cradle. Don't see the point of them releasing this at all. Of course you can use your existing adapter. That was the reason why it was not included, as Nintendo did not want you to buy a second adapter if you already have one. Anyway, I just have my vanilla Cradle stored in a drawer. @SomeBitTripFan The power grip for the 3DS is available at Best Buy. (At least, when I was there a week or two ago). The only "data" you would lose would be the system clock/calender (you'll need to reset those), what brightness you had your screen on, and if you had wireless toggled on or off. @SomeBitTripFan The "Niko Power Grip" requires no tools and clamps on to the back of your 3DS. It acts like just a mobile charging cradle + comfort grip, and won't void the warranty. The "Nyko Power Pak" replaces the internal battery with a bigger one and requires replacing the back plate. The two are not the same device. No way was I going to void my warranty by removing the stock battery and back-plate from my 3DS. With the Nyko Power Grip, even with 3D mode on, I can go over 10 hours gameplay on low brightness (which is even brighter than the original DS) and leave my 3DS in standby mode for days at a time. @Heatran5400 Nintendo already gave ambassadors 20 games for free, so I think that's fair enough. This should have been included in the first place, if you ask me.